Robe lighting is showcasing nine innovative new products on stand L80 in Hall 5 at PLASA London at ExCeL London, October 6 – 9. Products will include all those launched at Prolight+Sound, Frankfurt in April – The Pointe, MiniMe, CycFx 8, Cyclone and MMX Blade – highlighting some brand new concepts - all embracing Robe’s smaller-lighter-brighter and more eco-friendly philosophies. 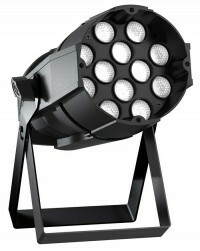 Newly launched at PLASA is the Parfect, a tough PAR-can styled plastic housing featuring Robe’s LEDBeam 100 lightsource. The Robe Parfect, is an LED source ACL beam at an affordable price that is made in Europe. This unit is a static version of the massively successful LedBeam 100 and retains all the key features of this, including both CMY & RGBW colour control, tungsten emulation, Zone Fx, selectable and variable colour temperatures - and the really powerful, punchy 7° beam. The compact and lightweight moulded composite unit comes complete with a combined hanging bracket / floor stand. Wireless DMX, clip-on diffusion filters and detachable barn-doors, are available as extras. In just five months, The Pointe has become Robe’s fastest selling fixture ever – with over 10,000 orders placed to date. 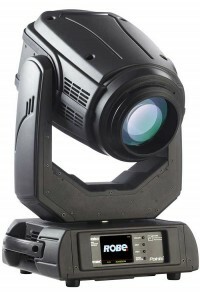 The Pointe is a small, super-bright and very fast multi-purpose moving light unit, with an intense and sharp parallel beam and a host of features making it a truly unique and versatile lightsource. These include a 5 – 20 degree zoom with full focus control, variable frost, two separate prism effects, a rotating and a static gobo wheel and inbuilt colour wheel. The lightsource is the Osram Sirius HRI 280W discharge lamp, with an extremely compact arc gap. The Pointe is fantastic for creating WOW factors on a large and small scale, and special characteristics include phenomenal speed and an impressive list of additional creative features like linear and circular rotating prisms, rotating and static gobo wheels. A custom developed homogeniser works with the rotating gobos to spread the light evenly and achieve optimum projection quality. A variable frost effect instantly transforms the output into that of an efficient wash light. This robustly built, reliable fixture weighs just 15.2kgs. Ideal for bar, club, restaurant and retail lighting, the MiniMe is an effects lighting luminaire with the addition of full video output. This small, neat, fast moving fixture is LED driven with a 20,000hour lifetime lightsource. Colours, gobos and beam shapes are all digitally generated by the on-board micro media server. Custom artwork, still photographs and video can also be simply uploaded for projection, whilst live video can be streamed through the HDMI input. 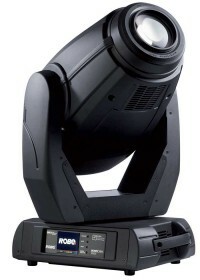 The ROBIN MMX Blade is an amazingly bright 1200-series equivalent lightsource utilising Robe’s popular MMX optical technology, complete with a framing shutter system comprising four fast ‘blades’ that can be individually positioned and angled plus or minus 45 degrees, with the whole Blade module capable of plus / minus 90 degree rotation. This allows precise shaping and fine-spotting of specific areas on a stage, set or performer, a crucial feature for all types of theatre and television productions. The Blade system can also produce fast, funky aerial effects by being programmed into quick-movement chases and sequences. An animation wheel enables the projection of dramatic fire, water, flame and other theatrical / environmental effects. It also has further innovative ROBIN technology features like hot-spot control, rotating gobos, CMY colour mixing, variable CTO, iris, rotating prism, etc. 8s to be built into a variety of matrix designs. The unit is supplied with many inbuilt pixel effects and pre-programmed sequences. Pre-selected Colour Macros also help to make it an exceptionally quick and easy unit to set up and integrate into any lightshow. Integrated tungsten whites are set at 2700 and 3200K and the CycFX 8 comes complete with Robe’s popular tungsten emulation, including theatrical grade dimming and red-shift effect. Wireless control is an optional accessory. 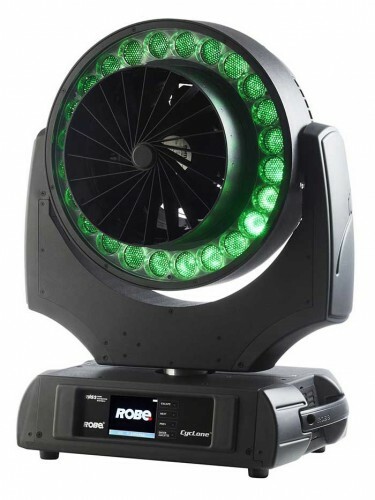 The ROBIN Cyclone is an inventive effects moving head product with an integrated fan in the centre surrounded by a ring of 24 high powered RGBW multichip LEDs. There is a zoom of 8 to 63 degrees on the LEDs - and a strong central airflow that can be combined with fog and haze to assist with creating the best quality atmospheric effects. The vari-speed fan can be independently DMX controlled, starting from a very low RPM and is a perfect complement to fog and hazers in any ‘live’ environment – from clubs to concerts - needing strategic hazing, from a mere wisp of smoke to full-on immersive low cloud coverage! Each LED is individually controlled and can be pixel mapped for the creation of eye-catching colour, rainbow, strobe, etc. effects. The Cyclone is perfect for lighting and cooling performers from a neat ‘footlights’ position where it can also produce dramatic ‘hair-blowing’ and ‘smoke-through-the-fan’ effects. The unit benefits from many features from Robe’s massively popular LEDWash series. Robe has a brand new booth again this year which will feature a stylish design and command plenty of presence. Robe is again a platinum sponsor of the PLASA exhibition, which brings additional benefits to guests including the Robe Fast Track Entrance and a chance to win one of 12 Apple iPad Mini tablets by completing your PLASA visitor registration through Robe. The iPad Mini competition will take place on the first three days of the show. The winners’ names will be selected from a ‘Lucky Draw’ on the booth each day during Happy Hour, between 5 and 6 p.m. Sister architectural LED brand Anolis will be on an adjacent stand, and all of Robe’s International team will join the Robe UK crew to ensure the very personal, friendly and multi-lingual service for which Robe is renowned!